One of the biggest problems facing homeowners is polybutylene, “poly,” plumbing. 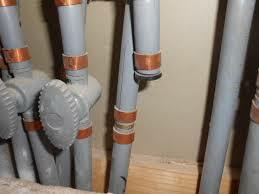 Polybutylene is a form of plastic resin that was used extensively in the construction of homes from 1978 until 1995. Due to the low cost of the material and ease of installation, polybutylene pipes were viewed as "the pipe of the future" and were used as a substitute for traditional copper piping. Apparently the chlorine found in municipal water supplies reacts with the polybutylene piping causing them to scale and flake and become brittle. The pipes become weak and potentially fail causing damage to homes and personal property. This is a multi-billion dollar problem in homes throughout the United States. Be sure to conduct a visual inspection for gray poly pipes. Look under the sinks and around the hot water heater. If you see gray pipes, you have a poly problem. Polybutylene underground water mains are usually blue, but may also be gray. A good place to check for poly is the main shutoff valve which is often attached to the end of the water main. Also, you should check at the water meter usually located at the street, near the city water main. Check both ends of the pipe because there are cases where copper pipe enters the home, and poly pipe is at the water meter. Replacing poly with copper is a must.